Thanks to the movie The Imitation Game, Alan Turing (June 23, 1912-June 7, 1954) is probably better known today than any time in history. A mathematician trained at King’s College, Cambridge, England, he was fascinated with the concept of formal proofs in mathematics, and formulated the concept of hypothetical devices that could solve any computational tasks. These hypothetical devices are now called “Turing machines” in recognition of his work. John Von Neumann, widely considered the founder of modern computational science, used Turing’s work as the theoretical foundation of his own. 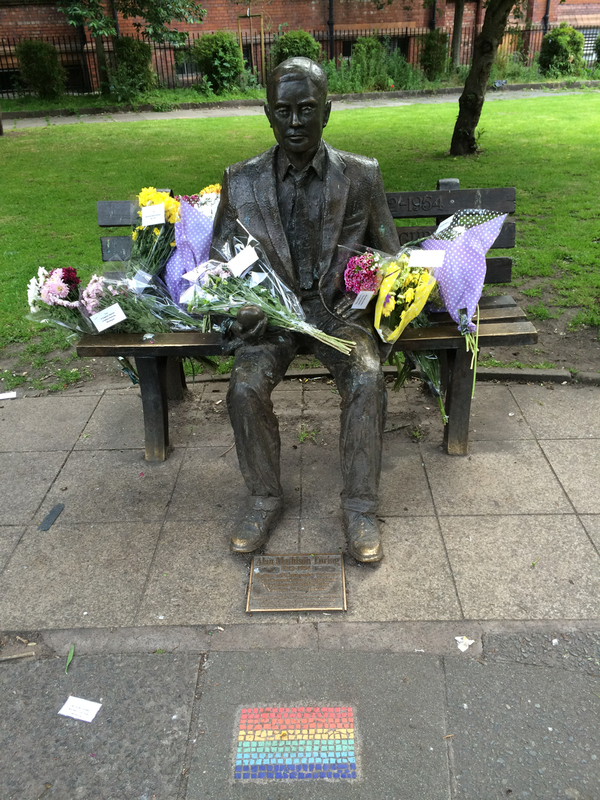 The Alan Turing Memorial is in Sackville Park, Manchester, England. It was unveiled on June 23, 2001. Photo by Lykara I. Ryder. 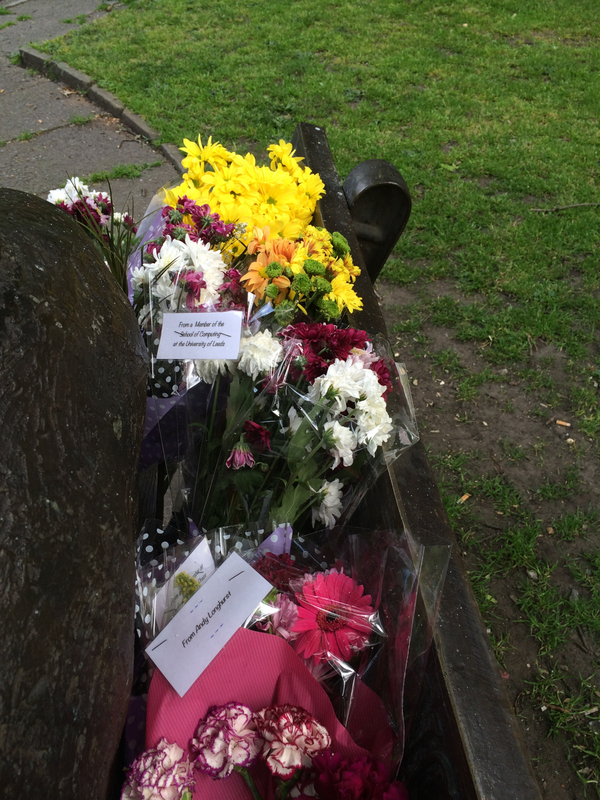 Each year, on Turing’s birthday, admirers bring flowers to the Turing Memorial in Sackville Park, Manchester, England. The park is near the Engineering and Physical Sciences Faculty Office of Manchester University. These flowers are “From Moscow High School No. 179” and “From a Computer Scientist at Indiana University, Bloomington.” Photo by Lykara I. Ryder. During World War II, Turing and other mathematicians were involved in a highly secret project to break German military codes at Bletchley Park, a mansion and grounds northwest of London. While The Imitation Game implies that Turing essentially hand-built a machine to break German codes, Turing’s contributions were not those of an electrical engineer but of the theorist behind the statistical analysis used to automate code breaking. His approach to breaking a problem into parts and then putting them together into a solution is the foundation of modern computer programming. 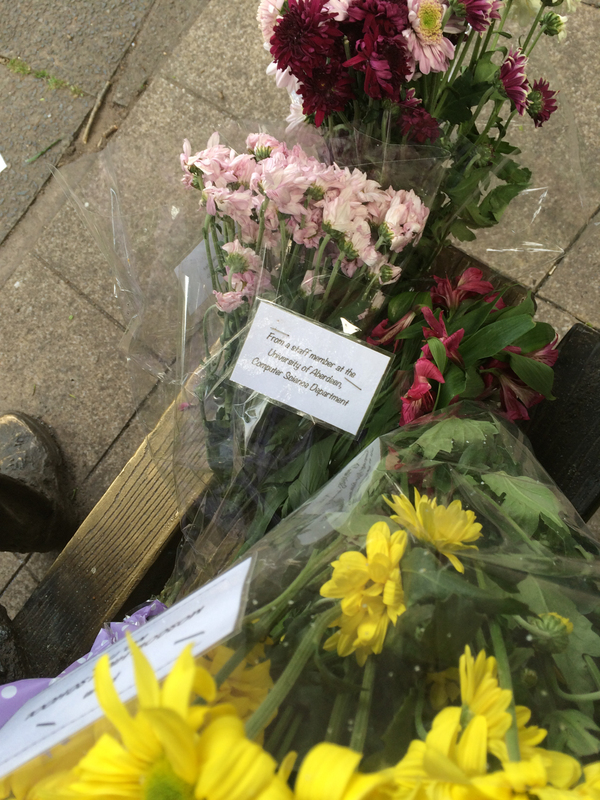 These are “From staff and students at the University of Bath” and “From Paul Heideman.” Photo by Lykara I. Ryder. 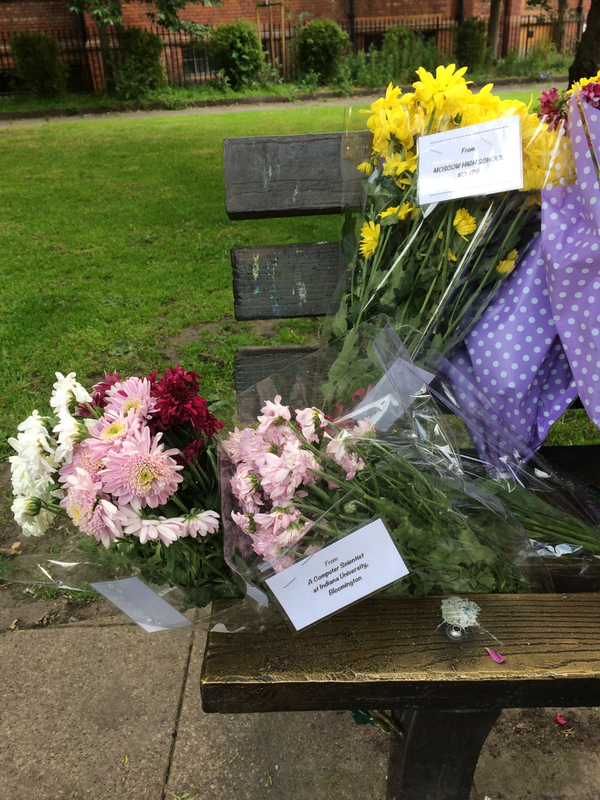 These flowers are “From a Member of the School of Computing at the University of Leeds” and “From Andy Longhurst.” Photo by Lykara I. Ryder. “From a Computer Scientist in Seattle, USA.” Photo by Lykara I. Ryder. 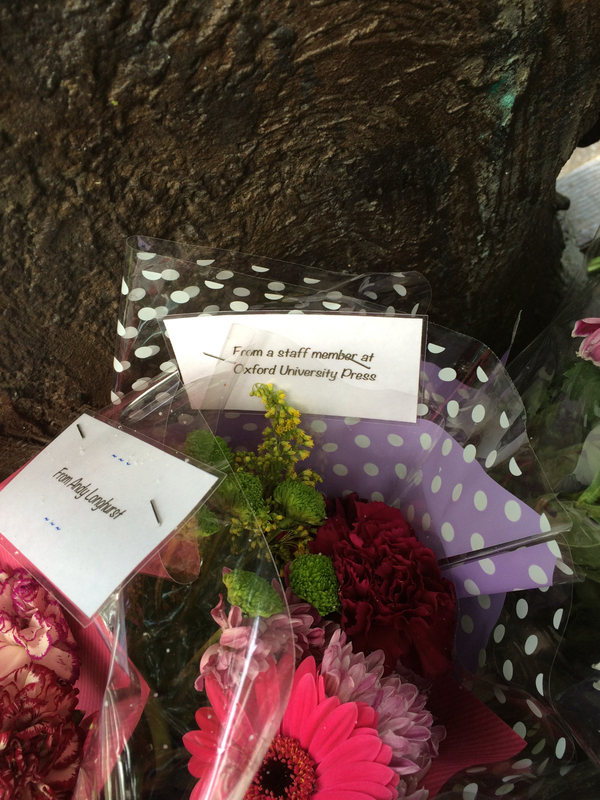 “From a staff member at Oxford University Press.” Photo by Lykara I. Ryder. 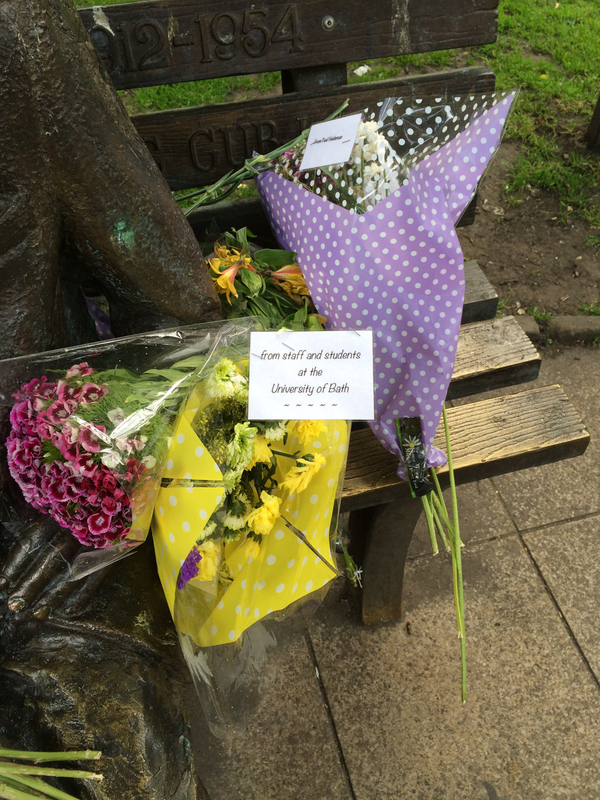 “From a staff member at the University of Aberdeen, Computer Science Department.” Photo by Lykara I. Ryder. 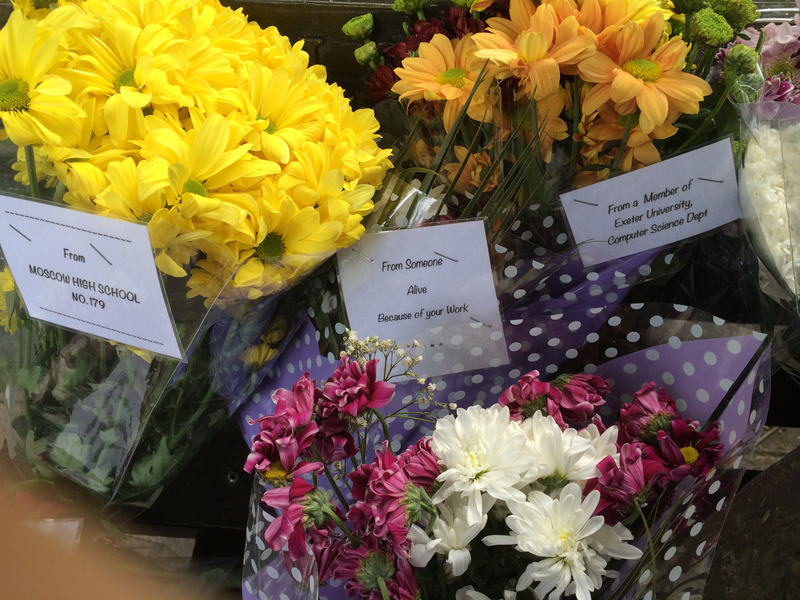 “From Someone Alive Because of your Work” and “From a Member of Exter University, Computer Science Dept.” Photo by Lykara I. Ryder. 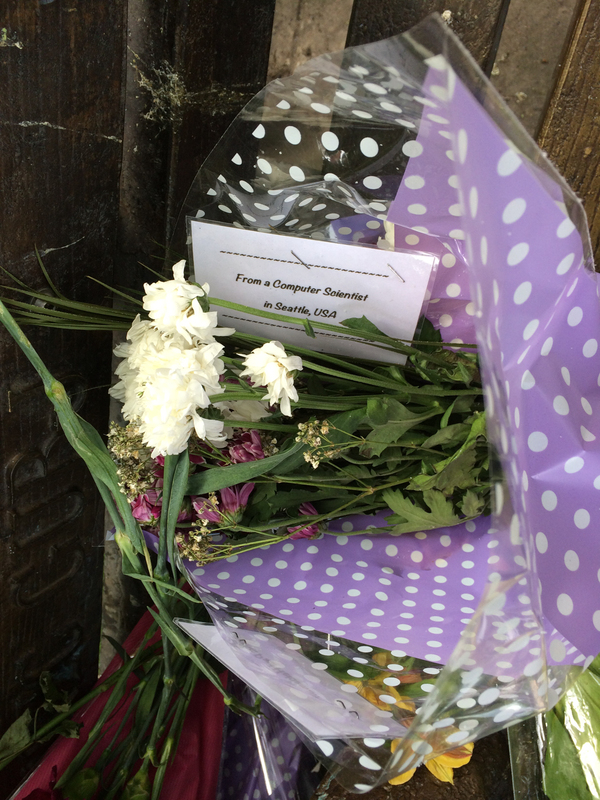 A blog organized a Flowers for Turning 2015 event, and listed a Roll of Honour of those who made donations.